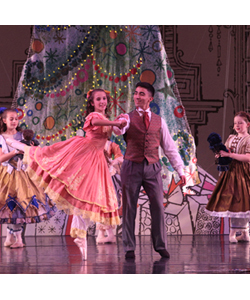 The vibrant, lavish Stapleton Ballet Nutcracker provides a magical start to the holiday season! Now in its 29th year, this production features inspired dancing, beautifully crafted sets and exquisite costumes. 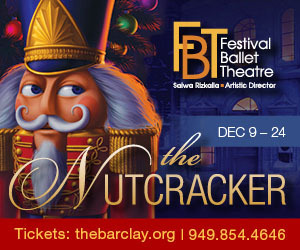 The Victorian-era tale opens with a joyful holiday party, where Clara is given a magical Nutcracker from the mysterious and riveting Drosselmeyer. Audiences will be on the edge of their seats as Clara's Nutcracker transforms into a prince to combat the evil Mouse Queen in the heart-stopping battle scene, featuring a firing cannon and a sparkling tree that grows to over forty feet tall! Imaginations soar as Clara and the Prince journey through a glittering snowstorm to the Land of the Sugar Plum Fairy, where visually rich surprises abound. Artistic Director Virginia Stapleton's engaging production is designed to delight audiences young and old and features guest artists performing with over 250 dancers from the Stapleton School of Performing Arts. Complimentary meet and greet with costumed characters after 1:00 p.m. matinees.